I am happy. I am sad. My Ireland died last weekend. Things will never be the same again for my generation. A certain kind of genetic mould was broken beyond repair. That was necessary. That is good. That has a dark side as well. I am jubilant that a great national wrong has been punished so drastically by a properly angered population. But I am fearful, and very fearful, of what lies ahead of my poor island. In the words of the old ballad, "stripped naked, hung high on a cross, her heart pierced by traitors and slaves." Let me get this final election-related yarn off my chest, please, and I'll try to get back to the sunnier side of the street next week. When this election was called in January, everybody knew that Fianna Fail would take a beating, and that their junior partners the Green Party would likewise suffer. However, in this space, I claimed that the political pundits in Dublin were under-estimating the thrashing the state's biggest party would suffer. I wrote, and I quote, "They will be absolutely slaughtered everywhere. It will be an unholy massacre!" And, of course, that is what happened. The voters turned their ballots into bayonets. They butchered and hacked and slashed Fianna Fail to death. They gave them no quarter. They showed no mercy. They paid them back for all the mismanagement of Ireland, for all the corruption and cronyism and abuse of power and arrogance and lies. 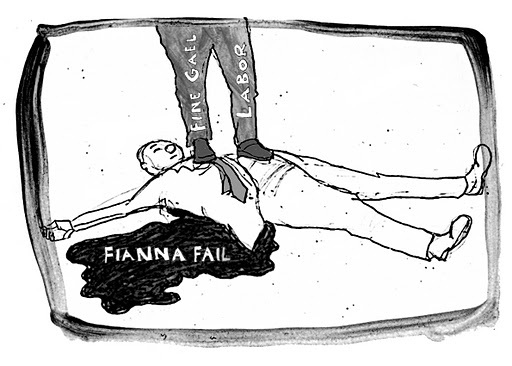 And Fianna Fail deserved all that they got and maybe even more. There are a few of them that probably deserve jail. Ordinary people have served time for less than they did. They crucified poor Mother Ireland on that crass cross, robbed and humiliated her at every level, and then the most cunning of them rode off into the sunset before the election with millions in their back pockets. And the rest of us who are too old to emigrate are clinging to the rigging of a sinking ship as our rising generations emigrate with all their skills and energy at the rate of at least 1,000 a day. It is nearly on the scale of Famine times. We are broken beneath a weight of national debt that is unprecedented. We have become the laughingstock of the world. Our plight is incredibly bad. If Ireland was a horse or dog it would have been humanely put down six months ago. My Ireland indeed died last weekend. As I write they are still counting or recounting in three or four constituencies ranging from Wicklow to Galway West. It is near certain, however, that the once mighty Fianna Fail party, now with only 18 surviving deputies, will remain in the teens when all the totting is done. Fine Gael has romped home as the biggest party, Labor will be the second largest grouping for the first time ever, and Sinn Fein's performance has been so dramatically good that they came within touching distance of overhauling Fianna Fail as the third largest party. Fianna Fail has only one deputy left in Dublin -- ironically the outgoing Finance Minister Brian Lenihan. Enda Kenny will be the next taoiseach (prime minister) after Fine Gael inevitably coalesces with Labor. That bit of carpentry will be finished inside days. Things are moving fast now. I say that my Ireland died because Fianna Fail, a power in every parish, were far more than a mere political party down all the decades of their power. They were a social force, initially Republican and honorable and close to the people, especially in rural Ireland. The TD (member of Parliament) was as powerful as the parish priest. The party was represented in every constituency, often holding two of the three seats in the many three-seater rural constituencies. Fianna Fail had a finger in every pie that mattered. I was a loyal member for many years because I felt they best represented what we are, warts and all. I even savored the roguery and rascality attached to most of the "strokes" they pulled off in the elections of the past. A Fianna Fail TD was almost always livelier company and better craic to be with than the normally more restrained and middle-class Fine Gael deputy. (In rural Ireland 20 years ago Labor Party deputies were as scarce as hens' teeth, and Sinn Fein had almost no presence). The Fianna Fail aura was somehow attached to the ruralities I enjoy, like fairs and markets and singing pubs and Irish music and summer festivals. A case in point here in Clare was the late legendary fiddling TD Dr. Bill Loughnane, who seamlessly blended his lively music and his political style alongside his medical skills. Many of his peers had the same skills back then. They were very different to the kind of fiddlers who percolated the party afterwards. In the wake of this bloodletting it is remarkable that it is now possible to travel across Ireland coast to coast without setting foot or tire in a constituency in which a Fianna Fail deputy survived. That is almost mind-boggling. And the Green Party was wiped out altogether by the angry people. Huge swathes of the midlands and the west have thrown both parties away into the rubbish bin. There is no Fianna Fail deputy, for example, in the kingdom of Kerry or in traditional heartlands like Roscommon, Sligo and Meath. No female soldier of destiny survived. Dynastic clans like the Haugheys have been wiped out. The extent of the "unholy massacre" I mentioned in January has surprised even myself. Frankly, there is the strong possibility that the party that has ruled the state for most of its lifetime has been so gutshot that it may not survive at all. That probably would the best long-term outcome for us all. Fine Gael and Labor are holding talks in Dublin as I write. Given their joint numbers and the fact that there is even a man called Ming the Merciless among the new herd of independents, this is an inevitable course. The bargaining is beginning. And I have to refer back again to what I wrote here last January. I said, "Whatever government we elect after the election craic and excitement will not be a helluva lot superior to what we have now. That is a fact too." I still believe that. The one ray of hope is that the oft-criticized Fine Gael leader Enda Kenny from Mayo displayed some signs over the weekend of being able to expand his style and substance sufficiently to be able to fill the shoes of a taoiseach.